An education initiative in South Carolina relies on exercise and movement to make students better learners. David Spurlock is 63, a former baseball and football coach with a bum shoulder and bad back and right now he’s busy planning a jailbreak. He has spent a lifetime walking the hallways, classrooms and athletic fields all across Charleston, South Carolina, his home town. Those classic images of school-aged children sitting still in desks organised into neat rows? Spurlock calls it “educational incarceration”. The educational model is broken, Spurlock says, and the key to fixing it is applying some of the most basic principles of sport and exercise. Students in some Charleston area schools sit on desks that double as exercise equipment, they enrol in “advanced PE”, receive regular yoga instruction and visit specially equipped learning labs each week where the line between education and physical education disappears entirely. One recent morning at Charles Pinckney elementary, 28 children, all aged nine and 10, rolled through the door in a single file, bouncing and giggling as they plopped on to the tiled floor. It was still early in the school year, and the fourth-grade students were eager to begin their weekly session of Active Brains. Far from a traditional classroom and not quite PE, it’s one of several initiatives in Charleston County schools that rely on exercise and movement to make students better learners. The posters on the wall read “Fitness not sitness” and “Exercise grows brain cells”, and Sommers’s young audience is captive. The fourth-year teacher walked the students through 15 stations – including the exercise bikes, the stair-climber and the mini-basketball hoop – and drilled them in the academic task associated with each one, usually flashcards or some sort of maths or spelling challenge. Pinckney elementary and Charleston County schools are particularly progressive in incorporating physical activity in classroom instruction. Study after study shows that exercise can play a major role in learning – effectively turning the brain on, keeping the motors turning and growing its capacity – but physical education has been trending downward, as many schools prioritise their needs in the face of academic demands and standardised testing. Many school districts have been de-emphasising PE since education programme No Child Left Behind was passed in 2001, says John Ratey, an associate professor of psychiatry at Harvard Medical School, and others even before that. The US Department of Health and Human Services recommends that children engage in at least one hour of physical activity each day. The American College of Sports Medicine, on its annual report card on physical activity by US children last year, issued a D-minus, finding that just a quarter of children aged between six and 15 were active for 60 minutes a day. As electronics become more pervasive, youth sports participation also has fallen nearly 10% since 2009, according to the Sports and Industry Fitness Association. While the science suggests these trends are having a profound impact on the health of a nation, Ratey says children aren’t reaching their academic potential either. 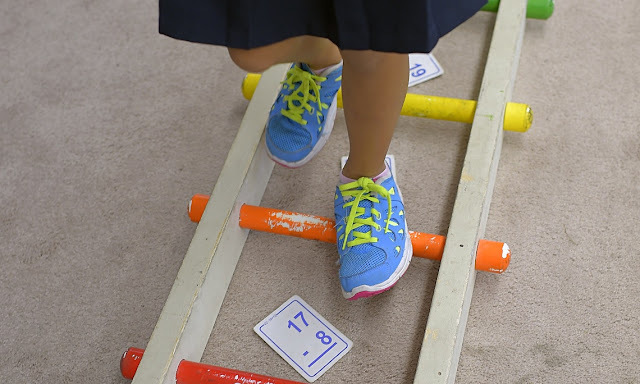 He has watched studies flood in from all over the globe in recent years, strengthening the link between exercise and learning, but the implementation in US classrooms hasn’t kept pace. Spurlock watched from one corner of the Pinckney classroom as Sommers demonstrated the final activity station and the kids then scattered. Spurlock has established more than a dozen of these labs – he calls them “brain rooms” – across Charleston, and helped other schools incorporate kinaesthetic principles into their regular classrooms. For Spurlock, it’s all still in the early stages. Five years ago he began studying other school districts and saw the way action-based learning was being used in high-performing schools. But Charleston has unique challenges. Its population is diverse and 70% of the city’s kids attend a title I school, which means at least 75% of a school’s students qualify for free or reduced lunches. According to the Centers for Disease Control, 15% of kids five and younger in South Carolina are overweight. Among adolescents, one in six is considered obese. The stats are even higher at the title I schools, which have a larger percentage of low-income families. In the Charleston County school district, nearly half the title I students are obese. Spurlock knew Charleston students had just 50 minutes of PE a week – an average of 10 minutes a day. Concerned about health as well as education, Spurlock thought academic performances would improve if the students were engaged in physical activity throughout the course of a school day. “I had to change the paradigm,” he says. Spurlock got to work. An old coach turned salesman, Spurlock is the kind of man who flies up a staircase two steps at a time, who can spin a yarn with southern charm but also cut straight to the point. When he visits schools he’s been around his entire life, the stakes, he says, couldn’t be higher. Spurlock started with a single “brain room” at Mitchell elementary, outfitted with a variety of exercise equipment along the room’s perimeter: balance boards, exercise bikes, a treadmill, boxing gloves and a punching bag, even a rock-climbing wall in one corner. They all face television monitors, which teachers use for visual aids. The idea was simple: the students could exercise while teachers taught. In addition to the brain room, Spurlock introduced “advanced PE” in two middle schools, a morning class that targeted students with bad grades and worse attitudes. They informally called it “puke PE”, and it was intended as an hour of physical exertion that would help propel students through the day armed with biochemistry weaponry that helped them focus and avoid behavioural hiccups. The results were mostly anecdotal, but Spurlock reports reading levels soaring and disciplinary referrals plummeting at all grade levels, and began trying to expand the programmes into other schools. An elementary school called Stiles Point raised nearly $50,000 through fundraisers last year and had two activity labs installed in the spring, one for younger students and another for the older ones. Teachers are still learning how to best use the rooms or even understand why they can be important. “Change is hard to come by and it’s slow, but the teachers who’ve gone in there and seen it have been saying, ‘Woo, I’m going back as soon as possible,’” vice-principal Ashley Dorsey said. At nearby Harbor View, the equipment is incorporated into every classroom. In addition to traditional desks, each room features equipment specially made for children that incorporates a variety of movements. There are desks with bicycle pedals, a stair-climber, a spinning seat, a balance board, a glider that mimics cross-country skiing motion. Her students quietly moved about the classroom, as Tillman spoke, occasionally swapping seats and pieces of equipment. Two kids were in the back of the room, their legs engaged with an exercise bike and a glider. Five others sat on giant exercise balls at their desks, including an 11-year-old named Amelia. Amelia’s father had first visited the class just a couple of weeks earlier, during an open house for parents and was stunned by what he saw. “I was totally excited,” Raymond Turner said. Turner happens to be a neurosurgeon at the Medical University of South Carolina, where he runs the residency programme, which means he’s well-versed in the effect exercise has on the brain. He is, in fact, in the process of implementing a similar programme with his residents. Most students and parents don’t know what Turner does, or that a study this year at the American College of Sports Medicine found that fourth- and fifth-grade students who engaged in vigorous exercise for at least 10 minutes before a maths test scored higher than children who sat still.Research has found, too, that children who are physically fit absorb and retain new information more effectively than children who are out of shape; that moderate exercise – 30 minutes for adults and 20 minutes for children – results in a 5% to 10% improvement in cognition. At the simplest level, Ratey explains that exercise results in an increased blood flow, which results in increase in oxygen levels. As more cells are engaged in activity, the brain sees higher levels of dopamine and epinephrine, neurotransmitters that traffic thoughts and emotions. Ratey explains that BDNF – brain-derived neurotrophic factor – and IGF-1 – insulin-like growth factor – are proteins that essentially build and maintain the cell circuitry, which encourages the growth and functionality of neurons in the brain. Altogether, it improves alertness and attention, sparks motivation, encourages nerve cells to bind together, and boosts the development of new nerve cells. Charles Hillman, a kinesiology professor at the University of Illinois at Urbana-Champaign, says over time, as the human body has fallen out of shape, so has the human brain. Behind the door of Room 211 at Pinckney elementary lies what Spurlock calls “the end of the evolutionary line”. It’s how he foresees the classroom of the future, not just in Charleston, but all across the country. Inside, 28 fifth-graders sit at the specially outfitted kinaesthetic desks. Some of them pedal bikes, some march on climbers, some swivel, some stand at their desks and sway back and forth. But almost everyone in the class is moving all day long – even the teacher. Stacey Shoecraft is stationed at the front of the room in a full-size strider, delivering instruction and lesson plans while exercising almost from the morning until the afternoon bells. Hers is the first classroom in the country to feature entirely kinaesthetic desks. This is her third year using all of the equipment, and any sceptics long ago disappeared. There’s now a waiting list every year, with dozens of parents and students trying to get in her class. The desks are manufactured by a company outside of Charleston called KidsFirst, which has shipped kinaesthetic classroom equipment to 38 states, plus Canada and India. To Spurlock, it’s still the early stages of a movement. He knows that schools utilising his equipment have healthier students, and he’s hopeful that Charleston test scores will soon show that they’re smarter, too. Spurlock can’t force Charleston schools to adopt his initiatives. Each school manages its own budget and each principal decides how curriculum is taught, because administrations turn over and new principals have different priorities. Spurlock has to constantly persuade Charleston’s educators to the benefits of physical activity, and sometimes even his most successful schools take a different direction.